The Devil sits on your left shoulder. The Right is the Hand of God. I recently spent time with a woman from the United Kingdom who is a vocal human rights advocate. As I was listening to her deliver her talking points, mostly in defense of women, LGBT people and immigrants, she touched on a topic that specifically piqued my attention- something I had been entirely oblivious too, but actually existed until the late 70’s. We’ll call her Mary. Mary was enrolled in a Methodist school at the age of 3. It was a prep school prior to entry to kindergarten where nuns would mold the young children to behave in a fashion that was appropriate to their religious doctrine. Part of the traditional, widespread curriculum during those formative years meant reprimanding children for being left handed. That punishment including beating the left hands of children with objects such as canes, sticks, even slamming books onto their fingers in order to “train” them to use their right hand, not only write with, but conduct any activity with, including throw a ball, play an instrument, raise their hand to respond to a question, use a food utensil or even shake hands. To use your left hand was considered a cardinal sin. An indication of a tainted soul. What occurred in religiously aligned schools in the 60’s was nothing more than state sanctioned abuse. It was an openly expressed intolerance for children- and adults- whose persuasion was to write with their left hand. To compound the senseless beatings, typically in front of their peers, they were isolated, publicly humiliated and treated as lessers by comparison to right-handed students. Mary explains this abuse lasted years. She was forced to learn to write with her right hand to avoid persecution, and worse, avoid suspicion that her spirit was influence by the forces of evil. Outside the school environment, the local population also applied rigorous stigma to left-handed individuals, both adults and children. 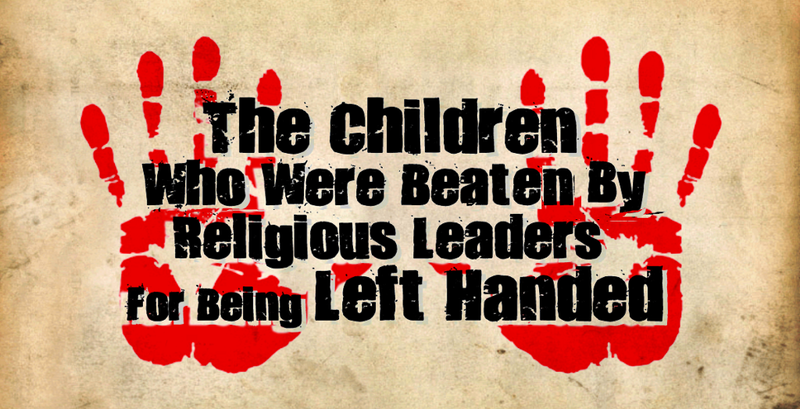 Rampant superstition motivated by religious teachings provoked fear of left-handed people within their communities. Engaging with a left handed individual was perceived as bad luck. Unconsciously using your left hand to point, or even wave was considered a rude gesture and often provoked retaliatory violence. Oftentimes, Nuns would tie down their left hand to the backs of their chair to ensure it wasn’t used. This led to an entire generation developing learning disabilities, such as inability to focus on studies, stuttering and emotional introversion. Their learning places became establishments of fear and torture. Their elders relentlessly convinced them that they were inferior and moreover, as they represented a danger to others, this was physically beaten into their conscious. Subsequently, most of these young children developed a sense of self loathing and even suicide ideation. They were taught to hate themselves, branded as God’s exiles, because they were born to use the “wrong” hand. Millions of children had to learn how to use their right hand to conduct simple tasks in order to avoid reprimand. They were forcibly trained to abandoned their genetic predisposition to use their left hand, and conform to an acceptable standard of right-handed activity lest God turn their back on them. This contradicts the practices of other faiths dating back centuries. For example, The Incas positively regarded left-handed individuals as people who possessed special spiritual abilities. In Buddhism, the natural persuasion to use the left hand implied wisdom, according to it’s teachings. In early Russia, “levsha” (left-hander) became a common noun for a skilled craftsman of status. But the damage inflicted on European children, most of them from infancy, had long term consequences. Many who have learned to be fluent with using their right hand still experience a form of PTSD when they see others casually demonstrating habits they had been condemned for. Prejudice against left-handed children (And adults) is not something that mainstream maintains an awareness of, despite so many survivors of this abuse still living to share their experiences. It stands as a testament to the unabashed attacks on people perceived as different from the majority by Religious extremists, and sadly, the extent they’ll go to in effort to force others, including young children to conform to to their immovable expectation in the name of God using the Bible as justification.